'Fry Me Omelettes' is not like your typical casual cooking game: You as chef, can fry eggs, in whatever fashion you may think of-- A beautiful sunny-side up, a creamy omelette, or a black pile of burnt crap! You will be facing the food critics at their mercy... or the other way round. 'Fry Me Omelette', the egg-frying simulation game, has finally reach ver 1.3 ! This is the defining version you'll love to play, especially for those who haven't play the game yet. Now Fry Me Omelettes is in complete package, as originaly intended. & Unlimited egg dish possibilities! It's basically a sandbox game-- You do the cooking and then get points and unlock stuff and achievements. First: you fry an egg or omelettes using mouse actions (to simulate cooking) with no strict manual instructions. The game is designed to be as 'intuitive' as possible (maybe not player friendly). You may not know how to do it properly--but try to trust your 'cooking instincts', it takes tries to get the hang of things. 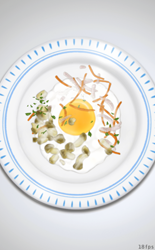 Little do people know there's 100+ of unique comments/critiques based on how you make your egg dishes. Ver 1.3 adds 20+ new critiques and even some random comments, bringing more variety & humor to our players. 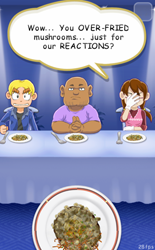 The game lets you make specific dishes, or try all kinds of 'experiments', or just to troll our judges. All in all, It depends on what you want to do as an omelette-frying chef. 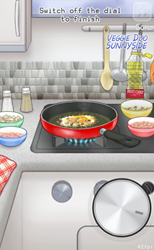 ​If you're an web gamer who's interested on sim games or cooking games, you might want to TRY 'Fry Me Omelettes'... Because It is, TRULY-- a cooking simulator like no other! You can click this button below to play the ver 1.3 ! You can visit the game's landing page or the development log here. Or visit via Facebook , Google+ or Twitter to follow & support my game. 'Fry Me Omelette' has finally reached release version. It's now available exclusively on Kongregate. Snouty Plays is back with an announcement: The upcoming online beta hosting of the game on MAY 30. 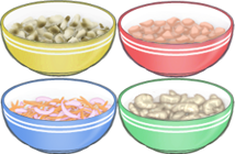 'Fry Me Omelettes' pre-beta demo is now updated to v0.59.4. Also, the demo's hosting period is extended till August 23. That was very amusing, I loved playing it. It is longer to play than I thought and it does require actual thought. A gameplay is done on my channel now. But only within a limited period! The demo ends on April 5, so hurry up & give it a try! Please sent your feedbacks via my e-mail. Thanks! !